After a morning’s visit to one of our Marlborough based clients it would have been terribly amiss of us not to stop in the High Street of this beautiful market town and visit Rick Steins which opened here just over a year ago. This stylish restaurant’s tastful décor set the scene for what I knew would be some seriously impressive food. 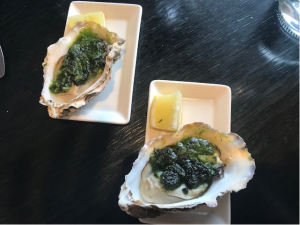 Having never tried an oyster before the waitress informed us that a good introduction into oysters is to have them rockerfeller style – grilled, topped with spinach and cayene butter. A flavour and texture not to be missed! Moving onto starters (well if you are going to have the dining experience you need to go the whole hog) I chose battered mackerel served with pico de gallo and chilli sauce and my dining companion ordered ceviche of seabass and prawns. Being a working lunch, the wines to compliment these dishs were ignored but the bottles of sparkling water kept the pallette fresh ready for our main course. I would have happily chosen any of the courses on the menu but we both selected the whole plaice served with roasted pepper, oregano and garlic, I refused the baby potatoes it was served with along with the warm complimentary sour dough bread being concious of my calories but my colleague found this all delicious! Finishing off with delectable coffees we reluctantly headed back to the office, a little later than planned having enjoyed the whole ambiance and it goes without saying the cuisine.